Hamilton is to Toronto what Milwaukee is to Chicago, according to a new Colliers International report on the city known as Steeltown, and it has an opportunity to become increasingly attractive to a wide range of businesses. There are advantages to being a medium-sized city anchored to a metropolis, and it’s hoped Hamilton can take advantage of attributes generally shared by such locations as it seeks to become a bigger player in commercial and residential real estate development. Low commercial and residential costs, a skilled and educated workforce, redevelopment opportunities, relatively short commuting times and amenities work in favour of the city of 510,000 located an hour’s drive from Toronto. Class-A office space rents for an average of $27.17 per square foot in Hamilton, which is lower than in surrounding cities, while commercial property tax rates run from 70 cents to a dollar lower per square foot than in Oakville, Mississauga, Burlington and Brampton. Hamber said there’s a 2.5 per cent vacancy rate and a much higher demand than supply for industrial properties, but they can lease for just four dollars net a square foot compared to five to seven in Burlington and other nearby municipalities. Newly built industrial properties would probably lease for $5.50 a square foot, but companies are reluctant to pay that in Hamilton. While several analysts have stated Canadian housing is overpriced, Hamber believes prices are where they should be in Hamilton, where the report says the median value of a home is $269,000. That compares to $439,000 in Toronto, $438,000 in Mississauga, $554,000 in Oakville and $401,000 in Burlington. “We’re getting a lot of people from Toronto coming here and buying homes because they can save themselves 40 or 50 per cent right off the bat,” said Hamber. There are three universities and 12 colleges within the Hamilton metropolitan area, and 51 per cent of adults hold a post-secondary degree or above, which creates a competitive labour force worthy of the attention of office-leasing businesses. Investment in the creation of the McMaster Innovation Park should further boost the city’s cause. 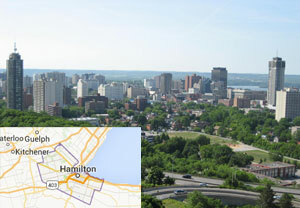 The City of Hamilton has implemented several redevelopment incentives, including grants for downtown building improvements, tax increment financing, assistance with access to capital, providing necessary infrastructure to support business growth, establishing brownfield redevelopment strategies and public-private partnerships to encourage construction downtown. That’s an area which Hamber conceded used to deserve its reputation for shabbiness but no longer does. The annual construction value of building permits issued within Hamilton has been more than $1 billion over the past four years, with activity in the commercial, residential and industrial sectors. Hamilton’s average commute time for residents is 20 minutes, as one-third of workers live within five kilometres of their jobs. New bicycle lanes are being added to the existing network and, for those living in the city but working in Toronto, the completion of the James Street North GO Station will connect downtown Hamilton to downtown Toronto’s Union Station by train. Hamilton also has many built and natural downtown amenities that neighbouring suburban communities lack, an attractive attribute for businesses placing a high value on such things being located within a short distance of their offices. Progress seems to be occurring, even if it’s slow. The Conference Board of Canada’s “Autumn 2014 Hamilton Outlook” report indicated Hamilton’s office sector saw a 2.6 per cent increase in employment and 2.2 per cent growth in gross domestic product in 2014. They’re projected to increase by 1.3 per cent and 2.3 per cent respectively through 2018. Professional, scientific, technical, finance, insurance, real estate and creative businesses are expected to lead the demand for more space. Perhaps the most intriguing part of future development in Hamilton will be seeing what happens on its former heavily industrialized northern waterfront where a massive steel mill is in jeopardy owing to insolvent owner U.S. Steel Canada Inc. being under protection from creditors via the Companies’ Creditors Arrangement Act. “That could bring 750 to 800 acres of land on to the market in the north end,” said Hamber. “Even at 30 per cent coverage, you would still have 12 million square feet of new building that could be put on that property. There are density limitations in the area, which rules out large-scale waterfront residential development, but Hamber expects to see more of that further east just outside of Hamilton in the town of Stoney Creek. And while Hamilton may aspire to emulate Toronto in some ways, there’s at least one area where Hamber is against it happening.